"Psh. Marketing claptrap!" you say. That was my first thought, too. And then Wes started sending me the details from the unveiling in Hollywood that's running in tandem with the bike's reveal in Milan. Nope. This is the real deal. But let's talk about what it's based on first. Yamaha's range-topping liter bike has undergone one of its most radical transformations to date. It's packing an all-new, crossplane 998cc engine (CP4 in Yamaspeak) with four titanium valves feeding each of the four cylinders. The bore is 79mm, with a stroke of 50.9, adding up to 197 horsepower at 13,500 rpm and 83 pound-feet of torque peaking at 11,500 revs. A titanium exhaust comes standard, as does a slipper clutch, aluminum fuel tank, and a magnesium subframe. More impressive is a set of standard 17-inch magnesium wheels (saving 2 pounds at each end) wrapped in 120/70 tires up front and 190/55s out back. The front discs measure 320mm, while 43mm KYB inverted forks join the party up front. The overall length is 2,055mm, with the wheelbase shortened by 10mm to 1,405. But like the Ducati 1299 Panigale that debuted earlier today, the magic is in the electronics. 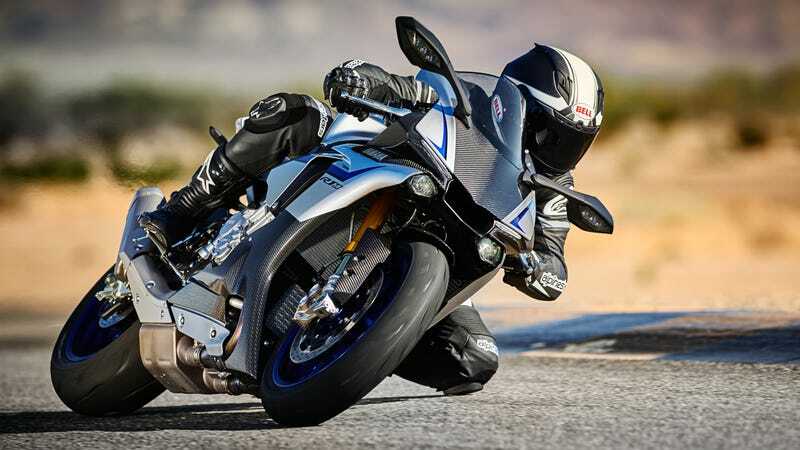 The R1 has a six-axis Inertial Measurement Unit (IMU) which processes massive amounts of data to tweak all the gizmos: traction control, launch control, wheelie control, ABS, and even slide control. A TFT display sits front-and-center, and there's an optional Communication Control Unit (CCU) that lets you download your track antics. And then there's the two LED headlamps, which look a bit… off, but apparently slowly dim when the ignition is turned off "as if the bike is gently going to sleep." Whatever. Here's what matters: a club weight of 439 pounds wet and a price tag of $16,490. But it gets better. If the new Duc is a rolling supercomputer, then the R1 M is a two-wheeled Cray programmed by Valentino Rossi. No, seriously. He had a hand in developing the electronics, which are described as "limitless". First, the R1 M gets the same engine with the same suite of electronics as the standard R1 all measured and manipulated by the IMU to tailor everything from the engine to the brakes to the suspension. It also comes packing the CCU to access telemetry data and GPS info, but it can also send that information over WiFi to a dedicated Android or iOS app. At that point, the rider can tailor the engine, traction control, launch control, and even the suspension settings to their desires, and then upload everything back to the bike through their device. Hell, even the MotoGP teams have to plug-in. The hardware upgrades include top-shelf electronically-adjustable Ohlins (similar to the Panigale), along with a polished and clear-coated aluminum tank, carbon fiber body panels, and a 200/55 rear tire with a 120/70 up front, both wrapped around magnesium wheels. Yamaha is only making 500 examples of the R1 M, and while I was expecting an MSRP in the high $20k realm, it's coming next year for $21,990.